Sinking land caused by intensive groundwater pumping in the San Joaquin Valley is releasing trapped arsenic — a known carcinogen — into aquifers that supply irrigation and drinking water for a million people, according to a new study published Tuesday in the journal Nature Communications. Arsenic, a naturally occurring chemical in the Earth’s crust, is undetectable by the human senses and has been linked to a host of diseases including heart disease, diabetes, and cancer. Researchers at Stanford University say residents should be concerned about arsenic levels in their water supply. "Arsenic is associated with the clay layers in the groundwater system from which they pump their water," says study co-author Rosemary J. Knight, a professor of geophysics at Stanford. "Overpumping is going to release that arsenic, and there has been significant overpumping during the recent droughts." The link between subsidence (or sinking land) and pumping of fresh water from underground is well-established, according to the US Geological Survey. A previous study led by Knight found that one way of reducing the negative impact of extracting water from the clay layers is for farmers to pull water from more shallow sand and gravel layers. Knight added that residents who obtain their water from a private domestic well in an area that has experienced subsidence are wise to get the water checked for arsenic. Researchers examined arsenic levels in hundreds of wells in San Joaquin Valley's Tulare basin during two drought periods. They found that in areas where land sank more than 3 inches per year, the risk of finding dangerous levels of arsenic in groundwater tripled. Tulare basin aquifers consist of sand and gravel zones separated by thin layers of clay. The clay, which acts as a sponge, absorbs both water and arsenic, which starts off as a solid. Overpumping draws water from the sand and gravel zones, causing the aquifer to compress as land sinks. As those layers press down on the clay regions, arsenic-rich water gets released into the aquifer. The study says overpumping in other regions could result in the same effect if they have three characteristics: alternating layers of clay and sand; a source of arsenic; and relatively low oxygen content, which is common for thick clay zones. The study's authors say that satellite surveillance can be a powerful tool in protecting communities from contaminated groundwater. Remote sensors that track the measurements of land as it collapses over time can be used to predict arsenic concentrations in groundwater. This data could serve as an early warning system for contamination. "Remote sensing data give us an incredible view of what is happening in our groundwater systems," says Knight. 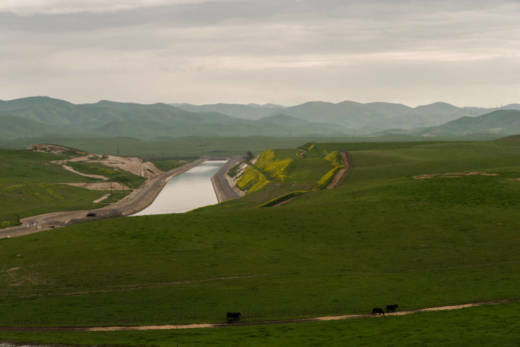 "My hope is that we are entering a new era in California, of sustainable groundwater management, and that data such as these can support and inform wise groundwater management decisions." The study notes that aquifers contaminated as a result of overpumping can recover if withdrawals stop; areas that showed slower sinking also had lower arsenic levels.